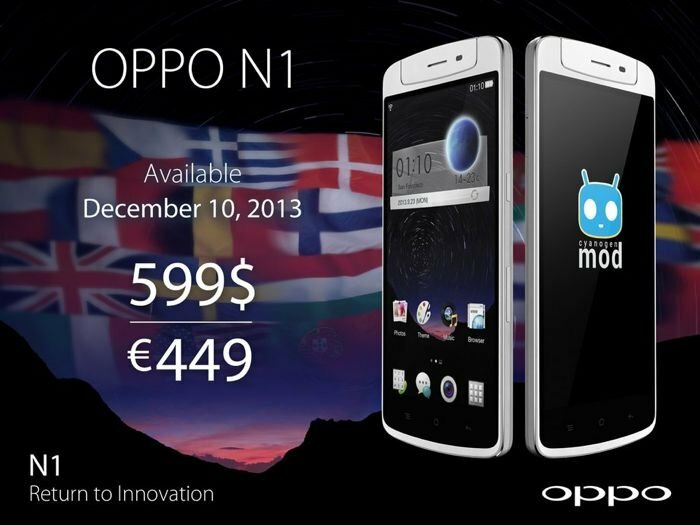 Oppo has announced that their latest android smartphone, the Oppo N1 will launch in the US and Europe on the 10th of December, the handset will be available with CyanogenMod and also Oppo’s Color OS, which is a customized version of Android 4.2.2 Jelly Bean. The Oppo N1 will retail for $599 in the US and 449 Euros in Europe, and the handset comes with some impressive specifications, which include a 5.9 inch full high definition display. The 5.9 inch Display on the Oppo N1 features a resolution of 1920 x 1080 pixels, the handset is powered by a quad core 1.7GHz Qualcomm Snapdragon 600 processor, it also features an Adreno 320 GPU and 2GB of RAM. One of the interesting features on the Oppo N1 is the smartphones camera, the handset has a 13 megapixel camera that is used for both the front and rear facing camera. The camera rotates 180 degrees, meaning that you have a high quality camera for taking photos and video and also when you are using video chat applications like Skype. We suspect that the Oppo N1 may end up being a popular handset in the US and Europe, considering that you can choose for a CyanogenMod version of the device, this is the first smartphone to launch with CyanogenMod.